Apartment Hotel Landhaus Lichterfelde, Berlin discount hotels and accommodation. 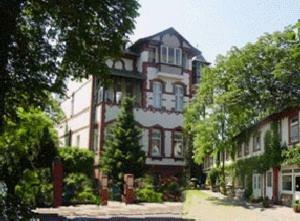 The building is an historical Villa with a Remise (former horse stables) which was built in 1896. Most apartments are located in the Remise. They are equipped with kitchen facilities, incl. dishes, flatware and cooking utensils. Therefore, no restaurant on the premises. Shower bath, sink, toilet, cable TV, radio, telephone and coffee machines are in each apartment. View photos, room descriptions and make online reservations at Apartment Hotel Landhaus Lichterfelde. Save on room prices at Apartment Hotel Landhaus Lichterfelde, Berlin.